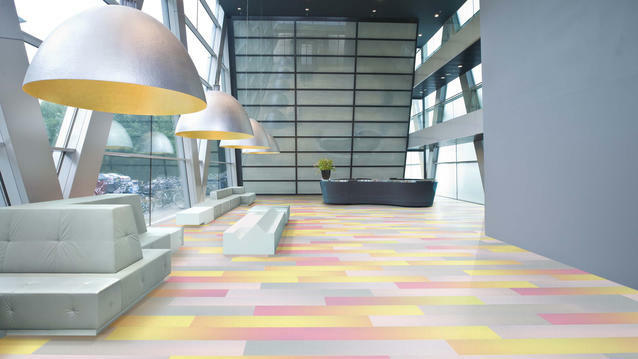 Create the ultimate disruptive design experience with our state-of-the-art digital print technology, where the possibilities for custom LVT flooring is expansive and your imagination. Inspired Textures for Delighting Designs. Experience warmth brought to a floor through the texture of felt. Then contrast it against the sleek metallic finish of a mylar ballon. In Trans Materia by Suzanne Tick, the power of transformation reigns supreme. Suzanne's design leverages the power of familiar materials like felt and mylar and evolves them in unexpected and amazing ways. She uses her heritage as an artist who collects debris to make something beautiful, and allows that unique perspective to color her design. In fact, Suzanne had actually been collecting mylar balloons for five years, just waiting for the perfect project that would allow her to transform them. With this design, we invite you to play experiment, and have fun while living Suzanne's design philosophy of taking what you know and turning it into what could be.